If you prefer to watch my video tutorial on YouTube instead of reading then follow this link. It seems so easy to thread a needle. You just push the thread right through the needle’s eye and that’s it. 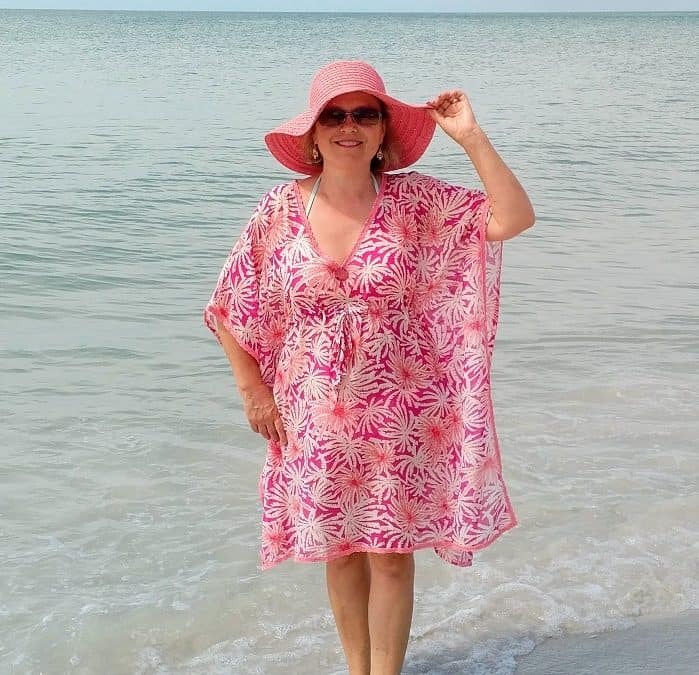 Yet you have to do it so often and it is so frustrating at times that many people, not only me, have come up with tricks, tools, and tips that help in the process of threading the little eye of the real tiny needle with a thin piece of thread. So, first of all, you take the thread end from the spool and make sure that the cut is nice, clean and there are no fibers coming apart. In most cases, it’s enough just to cut the thread with sharp scissors and lick the thread. Don’t break threads with your hands or with your teeth if you don’t want problems with threading the small needle eye. A messy edge will be hard to thread. Note: Some of the links on this page are affiliate links from which I may get compensated. You will never be charged for clicking them in any way. But sometimes cutting and licking don’t help. Look at this shiny thread. I used this thread to sew a metal frame to the leather purse I made. I didn’t want my hand stitches to be visible on the frame so I had to put this thread through the tiny eye of my leather sewing needle. It wasn’t enough just to cut the thread – fibers didn’t stay together and the thread was splitting at the end. This situation is common with some other types of threads too especially when the thread is thick (like an embroidery floss or yarn) and made out of multiple thinner threads. Also, in some cases we need to thread the needle with a double thread and it’s practically impossible to do it the regular way. In this case, we need to do something to keep all the fibers together to push it through the needle eye, right? I recommend using a few different things that will stiffen up the thread. 1. You can use a beeswax (they sell it in all fabric stores) but usually, we don’t have it handy when we need to thread a needle. So I just use a lip balm from Burt’s Bees – it has enough beeswax to hold thin threads together. 2. But sometimes beeswax is not enough. For example, it didn’t work with my silver thread. So I used a glue stick in this case and tried to make the thread end as flat as possible and cut it with sharp scissors to make the edge clean of fibers. 3. And if this doesn’t work then use a fabric glue. It holds everything without any problem. Just make sure that you use a proper size needle. The needle eye may be too small for the thread you plan to use – in this case, nothing will help you to push the needle through the eye. Ok. What else will help us to thread a needle? There are special needle threaders that are really easy to use and they are very handy. You can buy them in fabric stores. So how do you use one? Slide a thin metal loop into the eye of the needle, place the thread into the loop and pull the threader out of the needle. You see how simple it is. But these little threaders break very easily, unfortunately. And of course if you don’t sew very often you don’t think about buying them, or they get lost in a box somewhere. If you don’t have these handy threaders – don’t worry, there is something else you can use instead of them — dental floss threaders intended for flossing dental braces, crowns, and bridges. They usually sell them in big packs. This one, for example, has 25 threaders and they are thin and flexible. The action is practically the same: put the thread through the circular opening, stick the pointy end through the eye of the needle and pull. I have some more tricks for today. Use lamps with magnifiers! It will help you to see the tiny needles and thin threads better. For example, this lamp has a magnifier with a large diameter, which provides a wide viewing area, and offer distortion-free magnification. 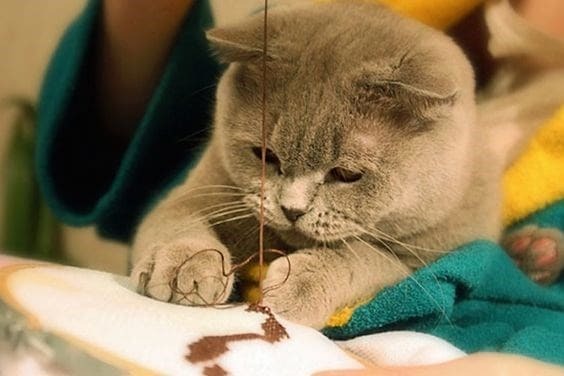 There is also another little trick to manage threading a needle. Maybe you will like it. Instead of holding the needle and trying to push the thread through the eye – hold the small thread end with your two fingers and move the needle over it. Another trick to thread a needle looks like magic to me. It seems so easy but in reality it does not work always. 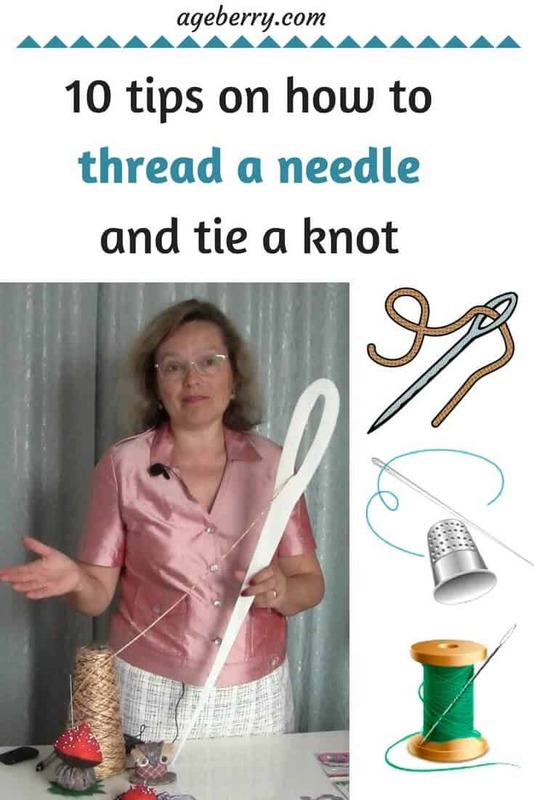 Try it for yourself – I could do it only with this huge needle and thick thread. So what is the point? I can thread this big eye the regular way without any problem, but it is cool ! Another tip — there are self-threading needles now. See how they look like in the image below. And they are even sold with this very handy decorative magnet holder. Just slip the thread into the groove at the top of the needle and push it down into the eye. Ok, I am out of tricks now about threading a needle but now let me show you how to tie a knot because usually, we can’t sew without a knot. There are some exceptions – but I will tell you about them later. So, there are a few ways to do it. First way – just tie the end of the thread twice or even three times. Another way (and most people do exactly that) – wrap the thread around your finger, roll the thread between your fingers and pull it tight. But I know just one more easy way to do it and the knot, in this case, doesn’t look messy ever. It works better when you have a double needle in the thread. For this take both thread ends and wrap them a few times (2-3) on the needle. Hold the loops with your thumb and index fingers (which already holding the needle) and pull the needle away with your other hand. And as I told you before I know 2 ways to start sewing without a knot. The first way – thread your needle with double thread. Start sewing and insert the needle in the loop. 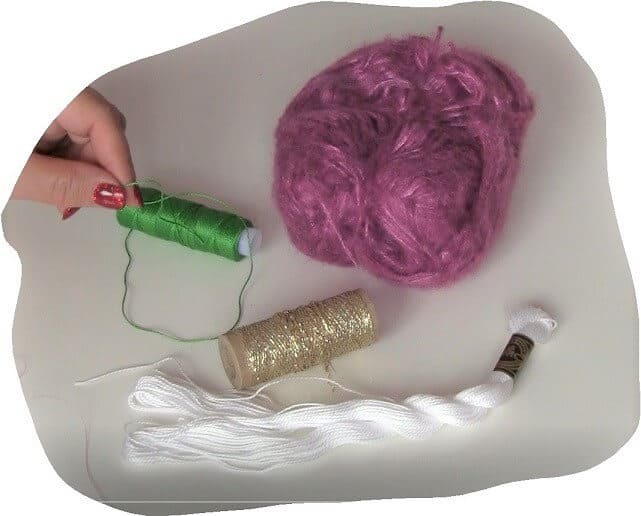 The other way – thread your needle with single thread, start sewing, make a small stitch right near the point where you inserted the needle, make a little loop and bring the needle through the loop, and pull the thread tight. It will form a knot close to the fabric. And in the end some more information about threading a needle. 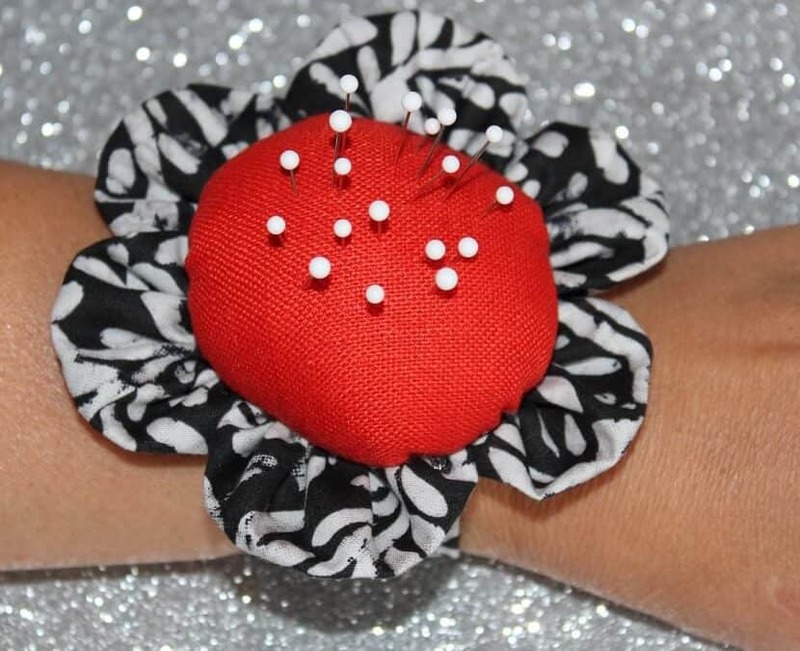 For any hand sewing, the length of the thread has to be about 45-80 cm (18-32 in). A thread too short is not good because you will have to change it often, a thread too long will be snagging or kinking. 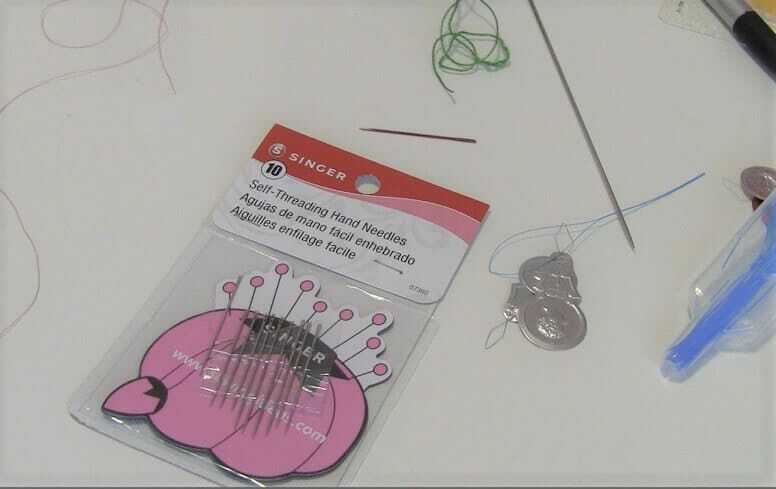 To prevent snagging you should thread your needle with the thread end that comes off the spool and tie the knot on the end you cut. This way the twist of the thread will be working with you not against you. Threading can be done with single or double thread. In most cases, we use a single thread for sewing because a double thread kinks easier. But sometimes it is better to have it double, for example for putting buttons, because it will speed up your sewing. Some people use beeswax to smooth the thread all the way so it slides through the fabric easier and doesn’t kink or knot. Just draw your thread through the edge of the wax and smooth it with your fingers a couple of times for even distribution. But I advise you not to use the wax for very light or fine fabric because sometimes wax can melt and stain the fabric. That’s all for threading a needle. 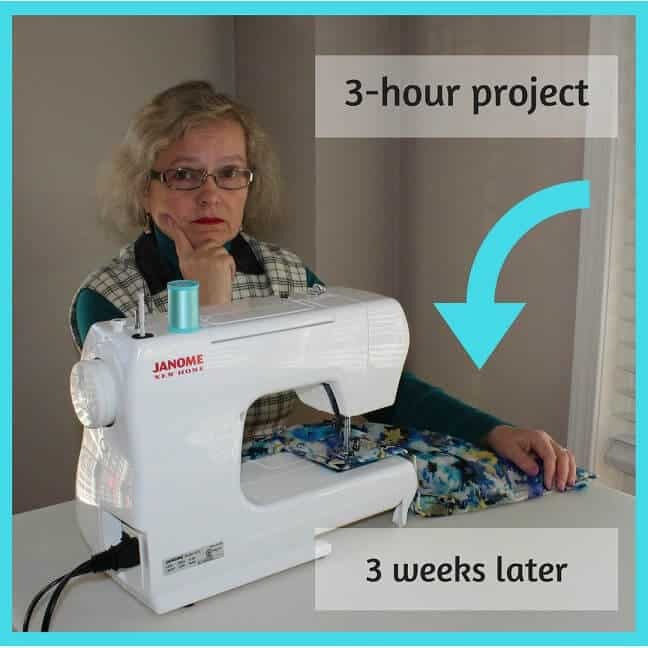 Check the links below for more easy sewing tutorials and share this article with your friends if you find it helpful.